Positive and negative streamers are studied in ambient air at 1 bar; they emerge from a needle electrode placed 40mm above a planar electrode. The amplitudes of the applied voltage pulses range from 5 to 96 kV; most pulses have rise times of 30 ns or shorter. Diameters, velocities and energies of the streamers are measured. Two regimes are identified; a low voltage regime where only positive streamers appear and a high voltage regime where both positive and negative streamers exist. Below 5 kV, no streamers emerge. In the range from 5 to 40 kV, positive streamers form, while the negative discharges only form a glowing cloud at the electrode tip, but no streamers. For 5–20 kV, diameters and velocities of the positive streamers have the minimal values of d = 0.2mm and v &#8776; 10^5 ms^(&#8722;1). For 20–40 kV, their diameters increase by a factor of 6 while the voltage increases only by a factor of 2. Above the transition value of 40 kV, streamers of both polarities form; they strongly resemble each other, though the positive ones propagate further; their diameters continue to increase with applied voltage. For 96 kV, positive streamers attain diameters of 3mm and velocities of 4 × 10^6 ms^(&#8722;1); negative streamers are about 20% slower and thinner. An empirical fit formula for the relation between velocity v and diameter d is v = 0.5d^2 mm^(&#8722;1) ns^(&#8722;1) for both polarities. Streamers of both polarities dissipate energies of the order of several millijoules per streamer while crossing the gap. Briels, T.M.P, Kos, J, Winands, G.J.J, van Veldhuizen, E.M, & Ebert, U. M. (2008). 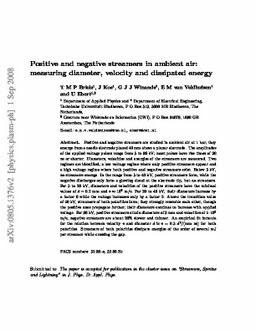 Positive and negative streamers in ambient air: measuring diameter, velocity and dissipated energy. Journal of Physics D: Applied Physics, 41.